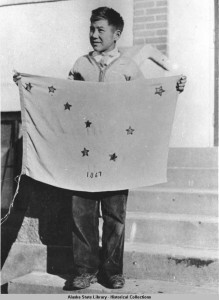 Benny Benson holding the Alaska flag at the Jesse Lee Home, Seward, Alaska. ASL-P01-1921, Alaska State Library-Historical Collections. Before 1927, Alaska did not have a flag. At the time, Alaska was still a territory, meaning that the federal government controlled Alaska and its citizens lacked voting representation in Congress. Since Alaska was purchased from Russia in 1867, Alaskans had flown only the U.S. flag. 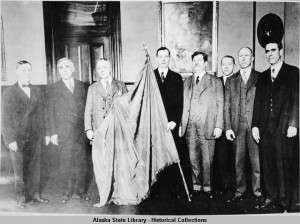 But in 1926, Territorial Governor George Parks thought having a flag would help Alaska become a state. He persuaded the Alaska American Legion to hold a contest open to all Alaskan children grades 7 – 12 to design Alaska’s new flag. By January of 1927, the contest rules were circulated to schools throughout the territory. One of the students participating in the contest was thirteen year-old Benny Benson. 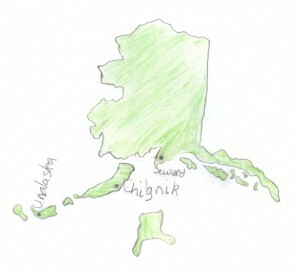 Map of Alaska showing locations associated with Benny Benson. Photo © Zaraea Marriott-Predmore and Hannah Marriott-Predmore. Benny Benson’s roots came from all over the world. He was born in Chignik, a small fishing village on the south shore of the Alaska Peninsula. His father, John Ben Benson, was a Swedish fisherman and his mother, Tatiana Schebolein, was an Aleut-Russian. He had a younger brother named Carl, and an older sister name Elsie. When Benny was only three years old, a terrible tragedy struck his family. A devastating sickness swept their village, and Benny’s mother died from pneumonia. Not long after they lost their mother, the family’s house burned down in a fire. These terrible events forced John Ben Benson to separate his children. Elsie was sent to a school in Oregon, while Benny and his brother were sent to an orphanage in Unalaska. The orphanange was called the Jesse Lee Home. Governor Parks and seven men with Alaska flag (probably Benny Benson’s flag), ca. 1927. ASL-P240-191, George Parks Photographs, Alaska State Library-Historical Collections. Of the 142 submissions, a panel of judges all agreed that Benny Benson’s design of eight stars of gold placed on a field of blue was the winner. In May 1927, the two houses of the territorial legislature adopted the flag design. Alaskans flew the flag for the first time on July 9, 1927. During the ceremony in Seward, Benny was awarded a watch with the flag emblem on it and a $1,000 educational scholarship, which he used to study diesel mechanics. Benny’s artful creativity was most definitely inspired by his own life’s experience and hardships, but his remarkable contribution to Alaska history also encouraged his fellow Alaska Natives, who had received citizenship and the right to vote only four years prior to Benson’s win. Not surprisingly, Alaska Natives who had struggled with their own stories of tragedy and loss, saw in Benny and his flag symbols of enduring strength. Benny Benson’s original submission for the flag competition. 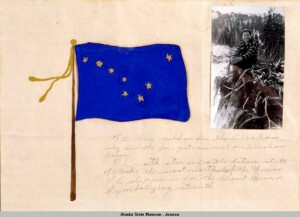 ASL-MS14-1, American Legion, Designs by School Children for Alaska’s Flag, Alaska State Library-Historical Collections. Since 1927, Benny Benson’s design has delighted Alaskans, especially children who are inspired by his story. The city of Kodiak honored their unassuming resident by naming for him “Benny Benson Drive,” and the Alaska Plant Materials Center released a variety of Kodiak wild grass named “Benson beach wild rye.” Anchorage honored Benny with “Benson Boulevard,” as well as the Benny Benson honor at Mile 1.4 of the Seward Highway. Finally, it was the poetic way Benny described the images appearing on his flag design that inspired Elinor Dusenbury and Marie Drake to write and compose Alaska’s state song. Today, communities throughout Alaska continue to celebrate Alaska Flag Day by retelling the story of how one creative Alaska kid made his mark on history.